Were you looking for the Halo 3 Covenant equipment, the deployable cover? The Covenant portable shield, formally known as the Pavise of the Worthy and otherwise termed as the Covenant emplaced shield, or the stationary shield generator, is a type of energy shielding device used by Covenant and its splinter factions for the protection of ground troops during military operations. Portable shields, which come in a number of models, utilize a dissipative shield generator powered by compact power storage cells to project an ovoid-shaped protective energy shield. Using gravitic anchors, the device can be robustly positioned in a desired position. Essentially a larger version of the point defense gauntlet used by Kig-Yar, the shield is used as protection by Covenant soldiers in both offensive operations and in the defense of strategic locations. When shot at, the shield transitions from blue to red in color before finally dissipating and eventually restoring. The shields are effective at deflecting small-arms projectiles, but struggle against explosives or plasma fire. The stationary shield generator was ubiquitous in Covenant service and was used extensively throughout their war with humanity. After the conclusion of the Human-Covenant War, Jul 'Mdama's recently formed Covenant splinter faction frequently utilized portable shields in battle. Used extensively throughout the Battle of Requiem, the Requiem Campaign, and the Blooding Years, the shield provided essential cover for the Covenant's soldiers. In Halo: Combat Evolved, if one of these shields is hit by a vehicle, it will be permanently disabled. In Halo 2, vehicles cannot collapse them on impact. An AI won't see past shield generators since it acts as a solid, opaque object to them. If a player has a shotgun, or other long barreled weapon, and they walk right up against a stationary shield, the barrel goes through the shield and one can shoot through it at opposing enemies. Similarly, it is possible to snipe enemies while never having to expose oneself and take cover again. The length of the weapon which is exposed should be disregarded, since the shot from most weapons come from the camera. In Halo 2 on the level Delta Halo, one can use the stationary shield generators placed at the entrance to one of the Covenant-held temple complexes to propel their vehicle away at a high speed by first disabling the shields, placing the vehicle on the generator and waiting until the device activates. This can also happen in Halo: Combat Evolved, though if the player is in a human vehicle, it is likely to fall out and die from fall damage. 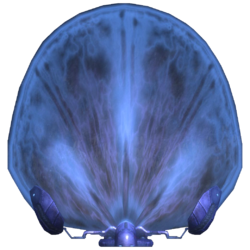 In Halo 2, if one melees a Grunt body into a stationary shield generator with the Sputnik Skull on, the body will hit the shield generator hard enough to disable it. In Halo 2, if one stands on top of a deployed generator and shoots it with a Plasma Rifle, the generator will overload and you will be floating on top of an invisible shield. A stationary shield generator in Halo: Combat Evolved. John-117 passing through one of many areas in which the Covenant set up shields during their attack on the UNSC Pillar of Autumn. A stationary shield generator in Halo 2. The three stages of a stationary shield generator, as seen in Halo 2. When shot at, the shield generator overloads and temporarily deactivates. A few seconds later it reactivates, returning to the initial stage. The three stages of a stationary shield generator, as seen in Halo: Reach. Render of a Stationary Shield Generator in Halo: Reach. Stationary shield generators in Halo: Spartan Assault. Concept art of the portable shield for Halo 4. Portable shields used on Requiem. Portable shields in Halo 4's Spartan Ops. Active Covenant portable shields used during the Battle of Nuusra. A Halo: Reach-derived stationary shield generator near three Covenant supply cases in The Halo Experience Showcase. ↑ 2.0 2.1 2.2 Spartan Games: Make your Halo table look awesome!